Like most Indian weddings, the Coorg wedding, or mangala as it is called in the Kodava language, is a fun-filled, colourful affair. It is a joyous celebration with much feasting and dancing, eagerly awaited by relatives and friends. It is also an occasion to meet, exchange news and gossip and look for matches for prospective brides and grooms; an occasion that allows women an opportunity to show off their saris and jewellery. What surprises visitors from outside to Coorg is the absence of Brahmin priests and rituals that solemnize a typical Hindu wedding. Instead, prayers are offered to ancestors at the sacred lamp and the wedding ceremony is guided by elders whose blessings are sought. It is these simple but meaningful acts and some unusual rituals that make the Coorg wedding rather unique. The traditional Coorg wedding these days is a two-day affair that sometimes spills over to the early hours of the third morning (if the dancers at the Ganga puje dance through the night!). The day preceding the wedding is called the the Uur kuuduva or Karik muripa day when preparations are made for the wedding day. The important ceremonies on the wedding day are the Muurtha - when the bride and groom are blessed by all those assembled, the Sammanda kodupa - when the bride is given rights in her husband’s house and the Ganga puje - when the bride is welcomed and accepted as a member of the groom’s family. In the past, the Karik muripa and Muurtha ceremonies were celebrated separately and concurrently for the bride and the groom in their respective ainmanes (ancestral houses of okkas or patrilineal clans) where they were blessed by their relatives and friends. Such a muurtha that is held separately for the bride or the groom is colloquially called a ‘single’ muurtha. The groom would then go to his bride’s house in a procession with a small group of his relatives and friends for the dampathi muurtha (common or ‘double’ muurtha for the bride and groom together) after which the bride was given the Sammanda rights. After that the groom would bring his bride to his home in a procession, and the Ganga puje would be held there. This practice is followed occasionally even today, although the venue is no longer the ainmane but a wedding hall that is hired for the occasion by each party. In such cases invitations are issued separately by the bride’s and groom’s parties and most invitees (except for close relatives) get to witness only the bride’s or the groom’s muurtha (depending on who the invitation came from), and do not get to see the bridal couple together at all! Nowadays, for the sake of convenience, the karik muripa, muurtha and the dampathi muurtha ceremonies are held at a common venue, together for both the bride and the groom. What follows is a brief description of the important ceremonies and rituals in a traditional Coorg wedding as it is conducted these days. Some of these rituals could vary between okkas. 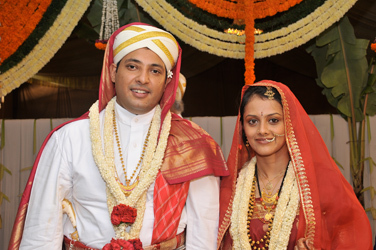 On the day before the wedding, the groom is dressed in a white long-sleeved kupya (a wrap-around knee-length coat, a traditional Coorg man’s attire) secured at the waist with a red and gold silk chele (sash). A red silk scarf with white checks is tied on his head. The bride is customarily dressed in an off-white sari with a gold border (or a coloured sari these days) worn in the Coorg style (with the pleats tucked in at the back of her waist, and the end of the sari fastened over her right shoulder) with a long-sleeved blouse and a vasthra (long embroidered veil) tied back at the nape of the neck. Members of the groom's and bride’s okka and uur (village) assemble (uur kuuduva) in the wedding house. While the women help with cutting vegetables (karik muripa), assisting the cooks in preparations for the feasts to follow, the men help in erecting the pandal, a temporary roofed structure for the wedding. There is much gaiety in the air and this is when gossip and match-making are rife. After the preparations for the wedding are done, the groom is led by his bojakaara (best man) to the sacred hanging lamp kept at the muurtha site. He offers prayers to his ancestors and to the deities of the okka, and his mother places a pavala maale (chain of gold and coral beads) around his neck, marking his status as the groom. The groom then seeks the blessings of his parents and all the assembled elders, touching each person’s feet thrice and raising his hands to his forehead. Identical rituals are followed by the bride who is guided by her bojakarthi (matron of honour). 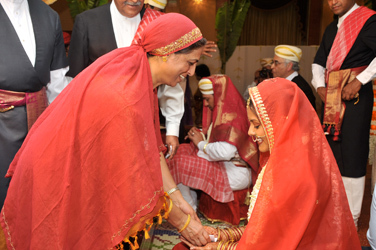 The bride’s mother ties a pathaak around her neck, marking her status as a bride. The pathaak is a short chain of coral, gold and black beads, with a gold coin pendant that is framed by rubies and has the figure of a cobra’s hood at its top. 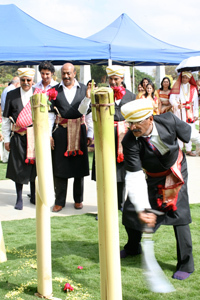 During this ceremony four men beating dudis (drums) sing the wedding song, while the volaga, the traditional Coorg wedding band, plays outside the hall. All those assembled then have a grand dinner and those who wish dance to the volaga music. Early on the wedding day the dais at the muurtha site is got ready. A white cloth canopy is tied over it and decorated in the traditional way. The sacred hanging lamp is lit and mats are spread on the dais. Two mukkaalis (low three-legged stools) covered with red cloth are kept at the centre of the dais for the bride and groom to sit on. On each of two other mukkaalis kept on either side of the dais, is placed a thaliyathakki bolcha (a silver or bell-metal plate with a small lamp kept on a layer of rice). A kindi (small metal pot with a spout) full of milk is placed on each of these plates. Two kuth bolchas (tall brass pedestal lamps) lit with wicks flank the muurtha site. That morning, the groom is led by his bojakaara for his ritual shave. A barber applies milk on the groom's face and shaves his facial hair and a part of his forehead. The groom is then led by his bojakaara for his ritual bath where his mother and two married ladies pour one pot of water each on him. After his bath, the groom is helped by his bojakaara to dress for the wedding ceremony. The groom wears a white long-sleeved kupya, a red chele around his waist and a white and gold turban that is partly covered with a red veil. A peeche kathi (Coorg dagger) is tucked into the front of the chele and an odi kathi (war knife with a broad blade) is attached at the back. He wears the pavala maale that his mother placed around his neck on the wedding eve, katti bale (thick gold bangles) and a jasmine garland. While the groom is going through these rituals, the bride, dressed in a silk sari and long-sleeved blouse, is led by her bojakarthi for the bale iduva (bangle wearing) ceremony. She sits on a mat spread on the floor and the bangle-seller adorns her wrists with glass bangles of various colours, at least one pair of which should be black, a colour that is believed to ward off evil. Her bojakarthi then leads the bride for her ritual bath where her mother and two married ladies pour one pot of water each on her. After her bath, the bride is helped by her bojakarthi to dress for the wedding ceremony. The bride wears a red silk sari with gold dots and gold border, a red long-sleeved blouse and a red musuk (veil) that covers her head and face. She is adorned with traditional Coorg gold jewellery for her hair, ears, wrists, fingers and neck, silver jewellery for her feet and a jasmine garland. Meanwhile, as the guests arrive, they are greeted by volaga music and welcomed by the parents or close relatives of the bride and groom and offered refreshments. When the groom is ready, the wedding band starts playing to herald his arrival at the wedding hall. He walks holding a gejje thand, an ebony staff adorned with silver bands and bells, that serves as his proxy at his wedding, if for any reason he is unable to be present there! 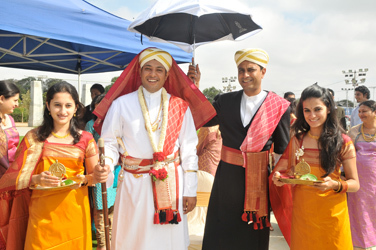 The groom is led by his bojakaara who holds an umbrella covered with white cloth over the groom's head. They are preceded by a girl holding a thaliyathakki bolcha and four men beating dudis and singing the batte paat (song for the way). The groom’s sister or cousin accompanies them, carrying the wedding poliya (a reed basket filled with puffed rice, coconuts, bananas, jaggery cubes and a kindi of milk on her head). This is believed to be a vestigial trace of the old custom where the groom’s party took provisions to the bride’s house for the wedding feast. When the groom’s party arrives, they are welcomed by the bride’s father and relatives and offered refreshments. A representative of the groom is then given the baale birud honour and he cuts down six banana stems in the traditional manner. This is symbolic of the groom’s triumph over other suitors for his bride and is indicative of his warrior roots. As they enter the wedding hall, a young girl of the bride's family washes the feet of both the groom and his bojakaara with water, and the bride's family members shower rice on the groom. A washerman spreads sheets of white cloth for the groom to walk on. The poliya brought by the groom’s party is handed over to a lady of the bride’s family who places it under the sacred lamp. The bride’s mother welcomes the groom and feeds him a mixture of rice, milk and sugar. 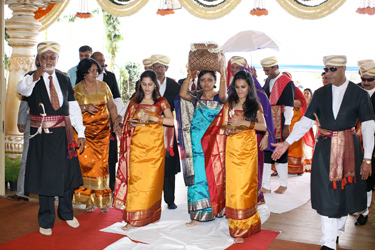 At the muurtha site, the groom led by his bojakaara walks thrice around the mukkaali that he will sit on (to the right of the bride), sprinkles rice on it and salutes it by touching it with both palms and raising them to his forehead. He then steps over the mukkaali with his right foot first and sits on it, facing the east with the assembled guests facing him. After he is seated, the bride is led to the muurtha site by her bojakarthi and she too follows the same rituals as the groom did before sitting on the mukkaali. The bojakarthi stands behind the bride, and the bojakaara sits slightly behind the groom to his right. The bride and groom are now blessed and given gifts in the traditional manner with rice showered on them. The mother is the first one to bless her child (even if she is a widow), and is followed by the father and then by other elders who are close relatives. After that, the women in the gathering come forward and bless the bride and groom and they are followed by the men. During the muurtha ceremony four men beating dudis sing the wedding song and the volaga outside plays the wedding music. At the end of the dampathi muurtha, the last one to bless the groom is the bojakaara and the last one to bless the bride is the bojakarthi. The groom now stands in front of his bride, showers rice on her head, offers her a sip of the milk in the kindi and gives her a cheela pana (a small red silk bag containing at least one gold, one silver and one copper coin). This signifies his sharing all his wealth with his bride. Then the groom offers his right hand to his bride and holding her right hand, he helps her stand up. The couple then exchange their jasmine garlands. The bride now receives the sammanda (rights of relationship) in her groom's okka. This is the essential ceremony that solemnizes the marriage. The elders of the bride’s and the groom’s okkas stand in front of the sacred lamp facing each other in two rows and recite the traditional dialogue that bestows the rights to the bride. The dialogue is characterized by a few exaggerated and humorous comments, and the elders improvise on it with some friendly banter. When the rights are bestowed, a respected elder in the bride’s party gives his counterpart in the groom’s party twelve pebbles, symbolic of twelve pieces of gold, which represent her birthright in her parent’s home that she has now given up. The groom’s elder accepts only eleven of them, allowing the bride to retain her ties with her family and the right to return to her parents’ house, should the necessity arise. When these ceremonies are over, those assembled are invited to the wedding feast by the mother of the bride. It is customary for the head of the family to eat with his guests, while the other members of the family and villagers help in serving the meal. Generally, women are served first. This is followed by a joyous dance when many of the assembled men, women, boys and girls dance to the music played by the wedding band. The bride removes all the ornaments on her feet and puts on silver toe-rings and ties a vasthra - symbols of a married lady. After praying at the sacred lamp, she goes to the well for the Ganga puje (worship of sacred waters) accompanied by her bojakarthi, women of the groom’s family and the wedding band. The bride sprinkles some rice into the well and prays. Then she gently drops three betel leaves along with three areca nuts into the well. She breaks a coconut with her husband’s peeche kathi and drops the coconut halves also into the well. If she cannot break the coconut easily she is teased, and women around her claim to be able to predict the gender of her first child, depending on how the coconut breaks or whether the betel leaves dropped into the well fall face first. 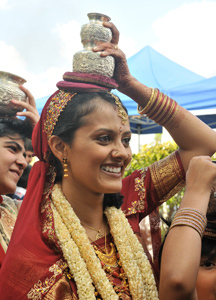 The bride then draws water from the well and pours it into each of four small pots. She balances two of the pots on her head, one on top of the other. Two young girls from the groom's family carry a pot each and walk with the bride, one in front and one behind her. This procession now returns to the wedding hall, accompanied by the wedding band playing a slow beat. The bride takes very small steps to the beat of the music. 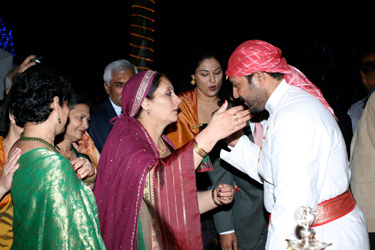 Members of the groom's family dance in front of her, welcoming her to the house. These days they often dance for hours (and brag about it later), slowing the bride’s walk and testing her stamina! When they reach the wedding hall, the pots of water are kept under the sacred lamp. The bojakarthi leads the bride to the bridal chamber where she sits with her veil covering her face. The bojakaara leads the groom to the sacred lamp to offer prayers, and then leaves him at the threshold of the bridal chamber. On entering the chamber the groom lifts the veil from his bride's face and presents her with an ornament, usually a gold wedding band. The content for this section has been provided by Boverianda Nanjamma and Chinnappa, researchers, who are the grandchildren of Nadikerianda A. Chinnappa, compiler of the Pattole Palame, a collection of Kodava folksongs and traditions. 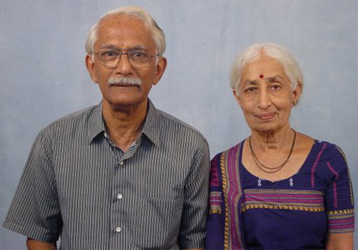 The couple translated the Pattole Palame, written in the Kodava language, into English. Currently, they are engaged in documenting information on the Ainmanes, the ancestral homes of the original inhabitants of Kodagu.